The Oxford Comma (aka the serial comma) has recently come into question when Oxford presented a branding style guide for Oxford University advising against using the Oxford comma. However, in an argument (seemingly with itself) Oxford published an official statement in favor of the Oxford comma in all cases (to clarify, the new rule was only for the P.R. Department and the University still stands behind the rule). The news has been surprising, confusing, and generally displeasing for most of the grammar police. The serial comma is one of the sanest punctuation usages in the written language. It gives each element of a series its own distinct place in it, instead of lumping the last two together in one hasty breath. Think about it — when you bake, you gather up your eggs, butter, sugar, and flour; you don’t treat sugar and flour as a pair. That would be crazy. Even Stephen Colbert chimed in during his interview with Vampire Weekend quoting the Elements of Style and saying that the flag is “red, white, and blue. Not red, whiteandblue”. Also in the world of puctuation, over on The Facebook a few of us have been having a spirited argument about a few of life’s most important things, namely double spacing after periods. Can we all just take a moment to recognize this issue and please stop? For some of us it is more than a pet peeve, it creates problems in website code that have to be fixed. So while you may be enjoying your afternoon I am finding and replacing double spaces with single spaces, which I am sure you can agree is not a vision of nirvana. Using a single space means that you understand that technology has changed since the decades ago when you first used to type. A single space means you realize not everything your teachers taught you in high school still holds true. A single space means you have respect for the journalists and designers who are working hard to take those extra spaces out of the drafts you’re sending us. The argument for continuing to use the double space has nothing to do with whether it is the right thing to do but that it is just a force of habit. I would like to include my frustration with ellipses. To clarify, an ellipses is always and only three dots and has a space on either side. Finally, there is the issue of the dash, both en dash and em dash. Take a few minutes to figure them out because if you use a dash to separate thoughts you are probably using the wrong one. Now if people would just stop saying “cut and paste” when they mean “copy and paste” I would really be thrilled. I am a fan of the Oxford Comma, glad to have ditched the second space, and for the reminder about the ellipsis and dash rules. I like the Bluebook form of ellipses — three dots, separated by non-breaking spaces, and a fourth dot (or other punctuation) if the ellipsis ends the sentence. Doing ellipses without spaces between the dots looks too compressed to me, though that’s probably just due to my prolonged exposure to the Bluebook. I am a two-spaces-after-the-period typer myself, and no apologies here. Much like the ellipses without spaces, single spaces after periods just looks too compressed. Makes me start feeling claustrophobic almost. And as someone who has done a great deal of HTML coding over the last 15+ years or so, I really don’t see how an extra space can mess up your coding unless you have a bad web programmer. Extra white space is ignored by HTML by design, so someone would have had to explicitly overridden that rule for two spaces to cause you any problems. To clarify to ellipses comment, I was mostly ranting about my frustration with seeing 4 or 5 periods in sentences when the writer clearly does not recognize that it should only be 3. I stand corrected on whether to use spaces before and after, since there are cases where it would be accurate and appropriate. @wappledoo the extra spaces are not always ignored by HTML – sometimes programs try to convert it into code and you get an ugly “20%”. I have had my share of frustration when dealing with the hassles an extra space can create. I also typically don’t want to include anything unnecessary in my code that assumes it will be ignored because there are too many variables with browsers, mobile devices, etc. In disagreeing with me you actually proved my point. For the applications you’re talking about, someone wrote bad code that attempted to convert the text to a URL (where spaces are encoded as %20), rather than as text (where white space is ignored by HTML unless contained inside a PRE tag or an element with a CSS property set to override the default of ignoring white space). It is your software programmer who is to blame if two spaces are ever a problem, not the person hitting the spacebar twice. You wrote: “an ellipses is always and only three dots.” The singular form is “ellipsis” – “ellipses” is plural. Thank you for correctly explaining the Oxford comma. The illustration is invaluable. As an English teacher for a decade and a current law student, I have lost many hours of my life trying (often in vain) to explain the Oxford comma. I plan to keep copies of the article and illustration handy, so I will be prepared when confronted with non-believers. While I understand that using two spaces after a period creates issues for HTML and other document markup languages, in print (and text displayed on a screen) the practice remains a significant reading aid. Perhaps it’s simply a personal quirk, but even with modern word processors and proportionally-spaced fonts I still find that a document using two spaces between sentences is vastly easier to read. This is especially true for E-mails where 10-point Arial (or some similar Helvetica clone) has effectively superseded 12-point Times New Roman as the font of choice as the smaller, more densely packed 10-point sans-serif fonts now prevalent make the separation of sentences less clear than previously. You might be interested to know, then, that the 7th Circuit all but requires one space after a period. Interestingly, it does so in the name of readability. Anyone who thinks a single space is more “readable” than a double space following a period is mentally ill, including the Seventh Circuit. The extra space permits the eyes to more readily identify the break between sentences. It’s just one more visual cue that allows you to quickly and easily distinguish between an abbreviation, for example, and the end of a sentence. The only reasonable argument against two spaces is that some variable width fonts add sufficient space following a period for it to look like two spaces, or that some publishing software platforms do the same regardless of font. But the fact remains that for many fonts the amount of space is insufficient, and a lot of what people type isn’t being processed by publishing software. For example, the space in your comment between “period.” and “Interestingly” doesn’t look any wider than the spaces between any two words in the sentence. If I knew with certainty that each sentence I typed would be given the equivalent of two spaces even if I only hit the spacebar once, I would only hit the spacebar once. But I am not at all confident that that is the case, based upon my own experience. I find that the “single space” fanatics are just as bad as the anti-Oxford comma fanatics (which is why I thought it was interesting the post above took opposite sides of these issues). The use of the serial comma and the use of two spaces share a common goal of clarity and readability of a sentence. The people saying we should take out the serial comma or use a single space are the ones following a convention for the sake of the convention — in this case, usually the AP Stylebook — rather than focusing on what’s easier to read. Let your sentences BREATHE, people. Vote NO on sentence claustrophobia. You raise a very good point that I failed to mention, which is, of course, always check the court rules for where you’re practicing. For example, the Eastern District of Washington State requires 14-point font (or did, the last time I checked, it’s been a while). I absolutely agree that when a court specifies a style, you should stick to that. In general though, if nothing is specified, then the safe option, in my opinion, is to remember that most justices are older, are familiar with the rules from typewriters, and tend to be tied the methods they used when they were younger. If one agrees with these assumptions, then I think my position follows naturally. If the assumptions don’t hold in your area, then my position may well be a poor one. The illustration with the breakfast foods is wrong. If omitting the Oxford comma turns two separate foods into a dish consisting of both foods, then you need another “and.” So if someone’s breakfast consisted of eggs and slices of toast with orange juice on them, the description would be “I had eggs, and toast and orange juice” (or “I had eggs and toast and orange juice” or something similar). Force of habit is not the only argument for double spacing after a final period. Many people favor it because they think it makes text less gray and more readable. And you could plausibly argue it helps distinguish between a period indicating an abbreviation and a period ending a sentence. For example: “Jim won a basketball scholarship to U.S.C. Chip didn’t.” Does it mean simply that Jim, not Chip, got a U.S.C. basketball scholarship? (“Jim won a basketball scholarship to U.S.C. Chip didn’t.”) Or that both were trying for a particular scholarship, and Jim beat out Chip for it? (“Jim won a basketball scholarship to U.S.C. [that] Chip didn’t.”) Secondarily, a double space prevents accidentally reading the abbreviation and the first word of the new sentence as a single phrase. Interesting. If you don’t mind me asking, what is the nature of your disability, and why do you think the extra space makes the difference? I agree with M Myers that the “eggs, toast and orange juice” example is silly (as much as I like it). Most of the time there is absolutely no question of clarity whether or not one uses the Oxford Comma, though this varies depending on writing style or complexity. But nobody dropped the comma for clarity. (Is there a term for a non-oxford comma, or lack thereof?) It was dropped merely to avoid the extra character in publications. That’s why you never see it in news articles. So if you aren’t paying per character, or aren’t desperate to shorten an article by a few commas, there is really no reason not to use the Oxford Comma. Furthermore, as an editor, I feel that the MOST IMPORTANT rule to follow is always be consistent. In legal writing especially we’re bound to have instances where the Oxford Comma really is necessary for clarity. Even if you only need to use an Oxford Comma 1% of the time in an article/paper/motion/etc., then you should use it in every single list in that entire article. I’d venture to guess that some very technical law review articles need the Oxford Comma for almost half their lists, so it gets very confusing when it’s not used in other lists in the same article. Conversely, if someone writes a short article or a blog post that is fairly simple, and does not use Oxford Commas, I could really care less. Personally, I find it much easier to be in the habit of doing something one way or another, not mixing it up all the time. 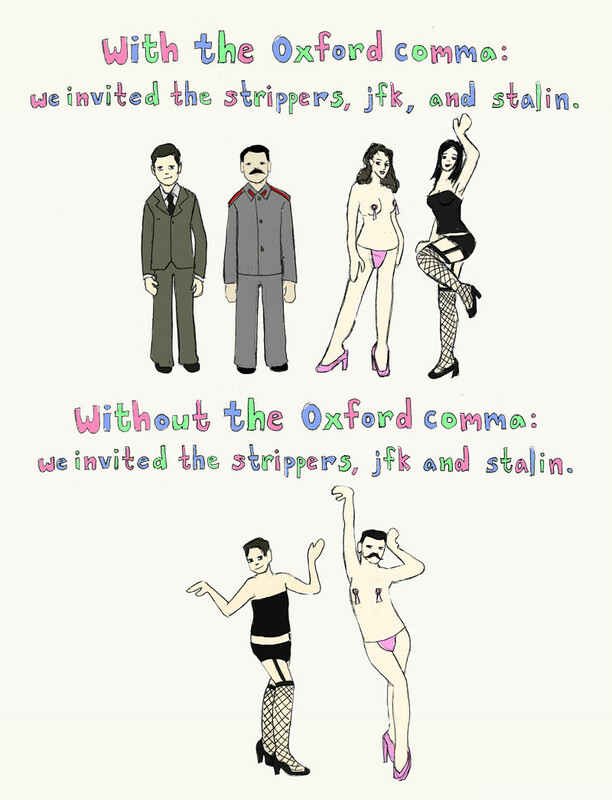 So I’d much rather be in the habit of always using the Oxford Comma. Then if it turns out I need it, I don’t have to go back and add it everywhere else, or accidentally be inconsistent throughout a paper. Actually, if I am unclear about something like “toast and orange juice” when reading, I’ll go back and see if the author uses Oxford Commas in other places to decide whether s/he meant orange juice on toast or not. Go forth and be consistent. Bryan Garner has written extensively on these subjects, plus quite a few more in Elements of Style, Typography for Lawyers, and my personal favorite, Legal Writing in Plain English. I am one who believes the Oxford Comma necessary for readability. I very much agree with Garner that our written works should read with a similar flow to spoken words, as this provides for easier, more pleasant reading for judges and attorneys alike. Without the Oxford comma, the flow of the sentence is broken up when reading. As for two spaces after a period, this is one of the biggest no-nos you can do. It destroys the visual flow of the document, creating blocks of negative space that make reading more difficult. As much as all of us in the legal industry have to read on a daily basis, and the extreme amounts of reading that judges and magistrates have to do, I think we each have a duty to make that reading as painless as possible, not only for the sake of the judiciary, but for the benefit that an easier to read document grants the client as well. What to you “destroys the visual flow of the document,” instead makes the document more readable to me. Having only a single space between sentences causes my eyes to slow down and try to make sure I’m catching the periods correctly. Having that extra gap allows me to easily differentiate the end of a sentence and the beginning of the next. In other words, while it might be one of the “biggest no-nos” to you, I despise having to read a dense document with only single spaces following periods, unless the software used to format the document has inserted some extra space. This is one of those issues where I am willing to admit there is no wrong or right answer. Some of us just prefer the double-space (believing it makes the document more readable), while others prefer the single-space (believing it makes the document more readable). However do you make it through a novel? There’s not a book on my shelf (or in my Kindle) with two spaces after a period. Take a caliper and measure the spaces, I’m sure there’s additional space following the periods (though probably set by kerning rather than double-spacing). As I said in an earlier comment, I agree that publishing technologies make it unnecessary for many people to use two spaces, but the amount of space following periods is not consistent across fonts (even proportional fonts), nor across different software platforms. For example, fonts like Calibri (the new Word default) result in eye-squintingly short spacing between sentences (looks to be about the same as that between words), while some other fonts (Arial, for example) have very narrow spacing between words, but noticeably (proportionally) more space following periods. But once again the point is not how major publishers or journalist style guides would have you write, but from a purely abstract state, what is easier to read? Those of you who say the blocks of “empty space” make it hard to read confound me, because such blocks only stand out if you put your eyes out of focus and let the whole page turn into a black-and-white blur. When you’re reading across lines, the gaps are useful indicators, not eyesores. It would be great if more publishers would add a bit more space, I’d cheer them on wholeheartedly. There’s definitely only one space. A good way to check is copying the text from an e-book and pasting it into Word or a text editor. Or you can just listen to all the professional typesetters who say to use only one space after a period. They’re the ones setting the text in the books, after all. Also, I’m not sure why you want people to stop saying “cut and paste.” You do realize that some actually do cut and then paste without copying. Ctrl X, Ctrl P (not Ctrl C). It’s actually quite common in editing. If someone were to cut and paste and they said “copy and paste,” would you be similarly annoyed? *I apologize for any grammatical errors or misspellings that may have occurred in this comment. I wouldn’t want to be a hypocrite or anything but not acknowledging the possibility that I could have exhibited the same carelessness of that which I am currently critiquing. Matthew Butterick has a website and a book (both of which are excellent) devoted to these issues and more. Go to typographyforlawyers.com if you are interested. Asides from your stirring words and thrilling rhetoric, there are a few things I didn’t realise; ‘cut and paste’ and ‘double-space-after-full-stop’ are both tools I utilise unknowingly, because they were what I was taught back in 1994. I am just delving into the reasons for NOT double-spacing, and I remain unconvinced, however I will try to avoid them in future, just in case I get that vaunted publishing job. However, I would like to make an argument in favor of the ellipses. The internet, especially in blogs, is a wonderful place to hold a conversation. Far more so than in printed media. Thus, a lot of verbal tools have to be reduced to text. The ellipses is a useful tool in conveying the indicative pause at the end of a sentence. It conveys a bit of emotion and depth to the sentence. “Tom *had to go to the shops.” There is a whole breadth of sarcasm implicit there. In response to my last comment, using the “*” or caps is a good way of emphasising when you don’t have ctrl-i, for example when typing into a comment box. I love the graphic on this this page. I want that comma painting over my desk. It is “cut and paste” if you delete the original. Correct me if I am wrong, but I do believe that an ellipses becomes four dots in the case of it being used in quotes to indicate omitted information that falls between the end of one sentence and the beginning of another.